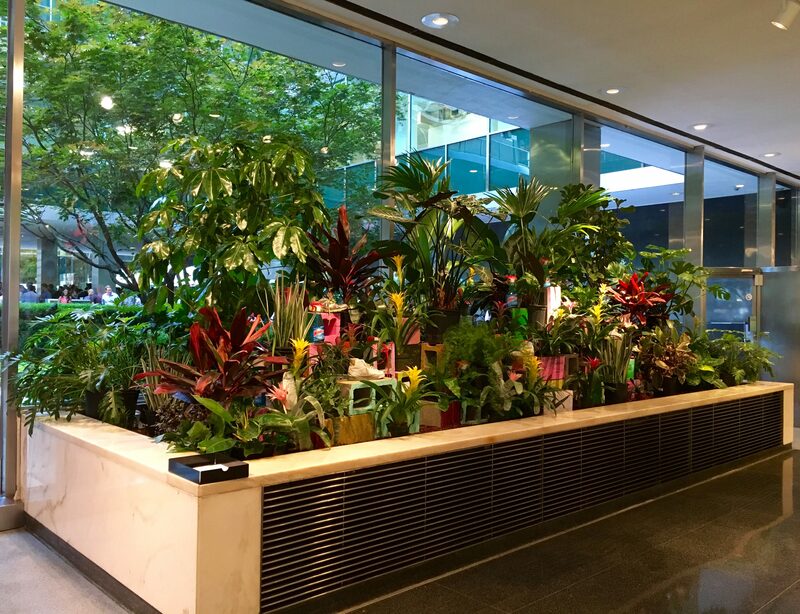 The Lever House Art Collection recently hosted Concrete Jungle Jungle Love, a site-specific installation by New York based artist Katherine Bernhardt. 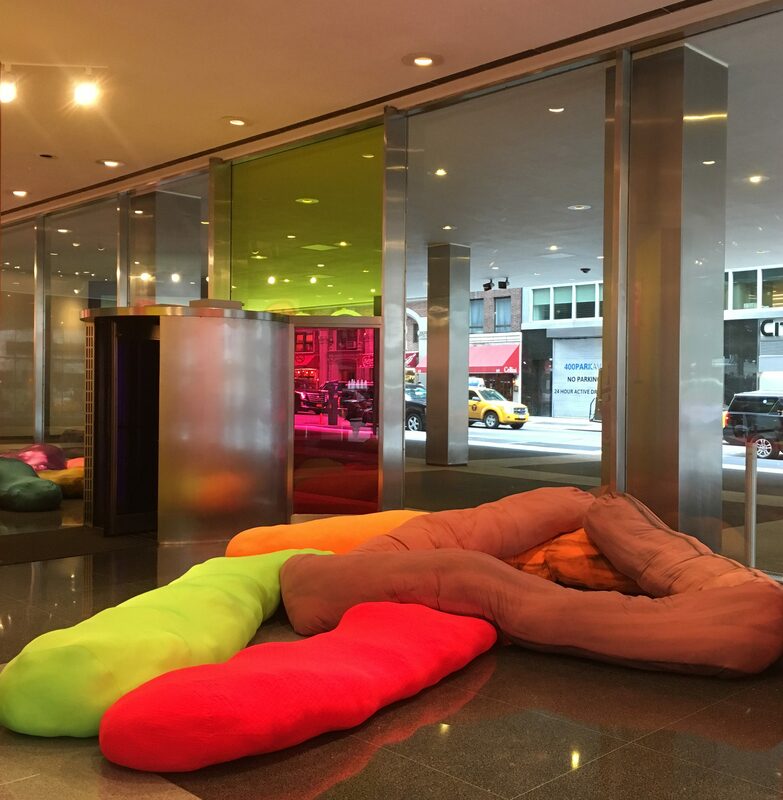 I happened to pop in to the exhibit which filled the Lever House Park Avenue lobby, while passing time before dining a nearby restaurant, as the installation’s vibrantly-colored elements drew me in from the street like steel to a magnet. 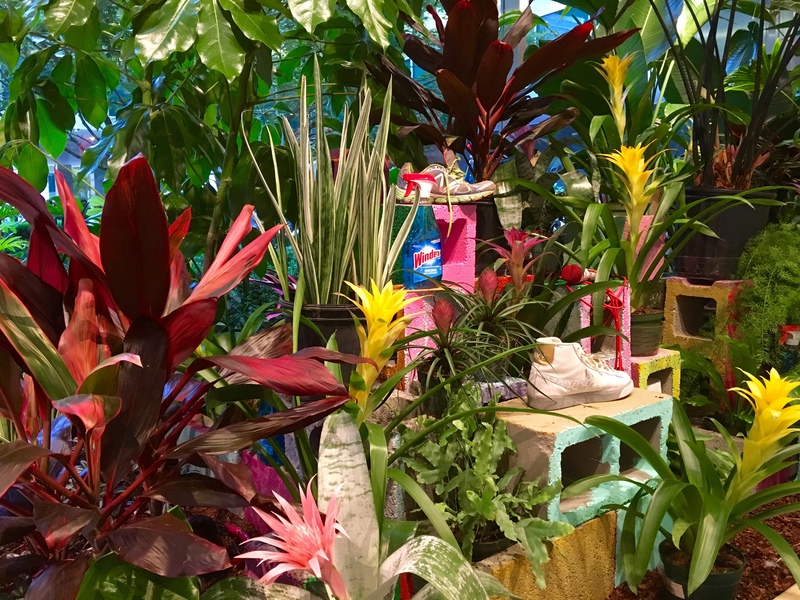 The explosively colorful exhibition playfully fused imagery and objects of modern culture (Windex, Toothpaste, Tropical Fruits) with that of the tropics. The commission was one of Bernhardt’s first departures from canvas, pulling motifs out of her paintings and giving audiences a unique three-dimensional experience of her work. 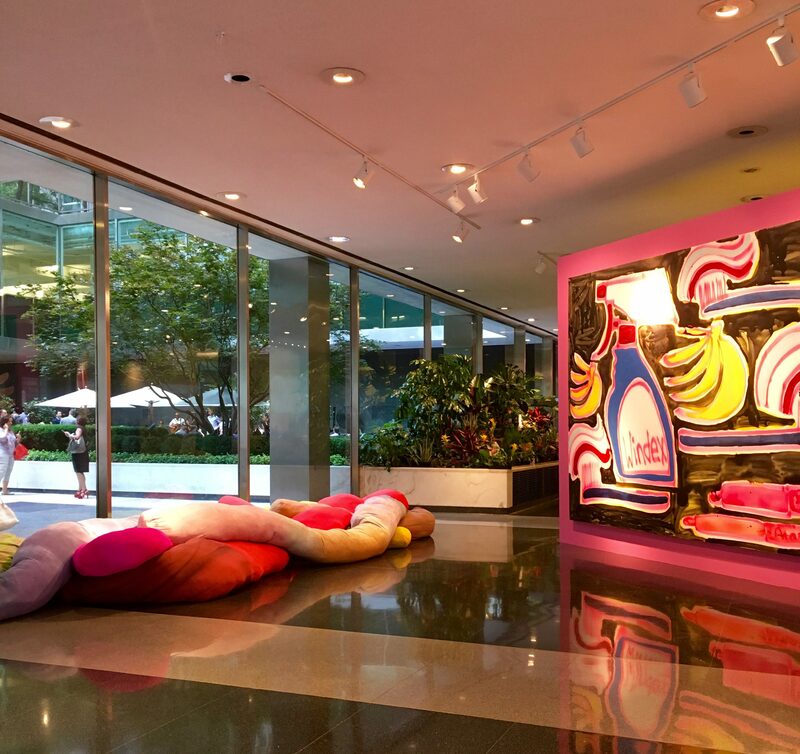 A combination of acrylic and spray paint canvases, dyed interactive soft sculptures (which the artist refers to as “Gummy Worms”) and a concrete block plant installation, the show’s multi-medium elements serve as a whimsical juxtaposition to the modernist architecture of the space. 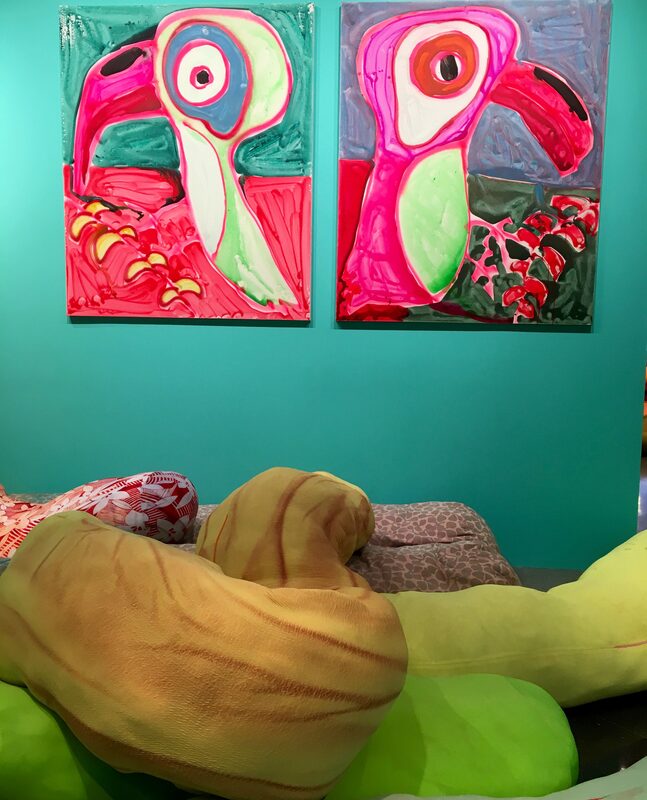 Bernhardt explains,”When constructing the show, I envisioned a giant fish bowl tank, with giant Jurassic objects, paintings, and soft sculptures. In this show, gigantism rules. 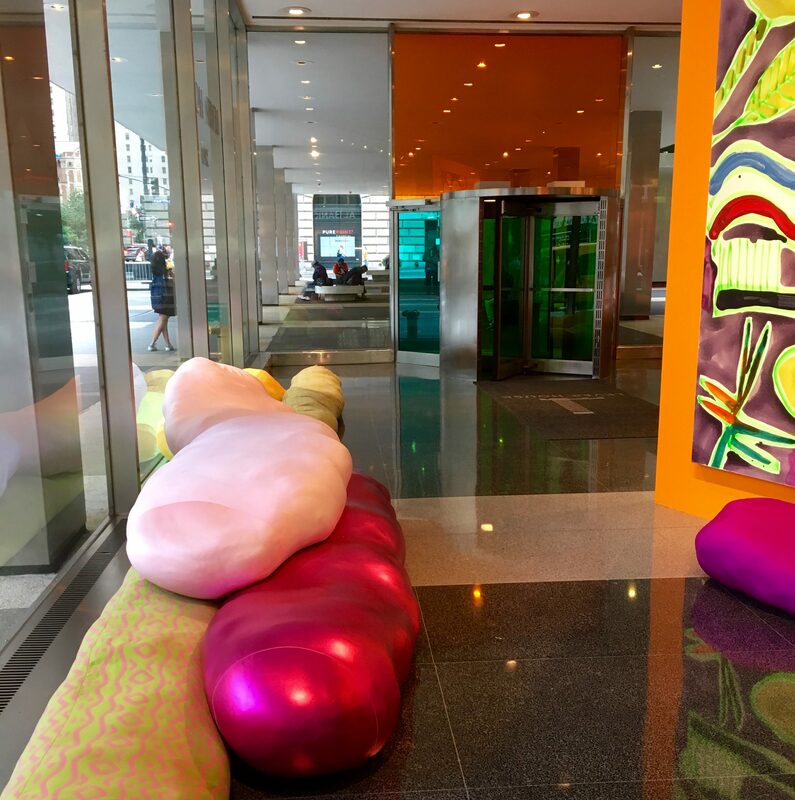 You’ll find giant gummy worm sculptures and giant paintings. 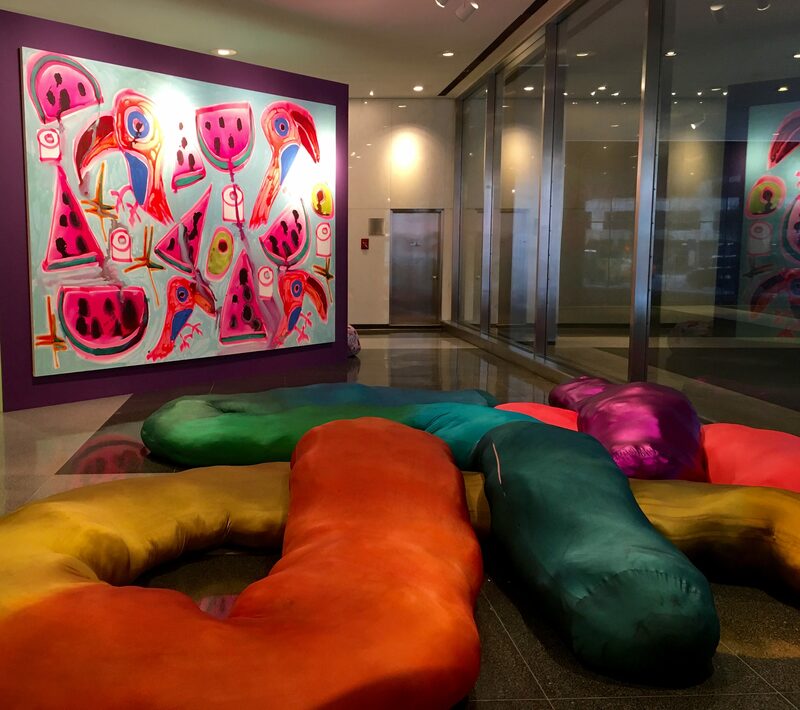 The gummies could also be seen as giant paint strokes that have fallen out of the paintings. 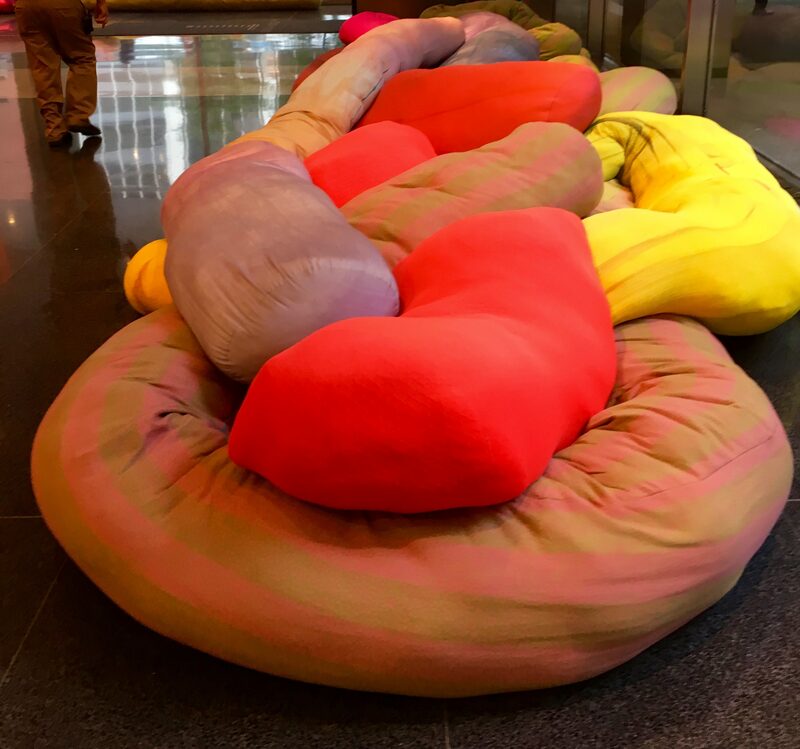 You can play on them or rest on them as well as admire the beauty of gummy worms. 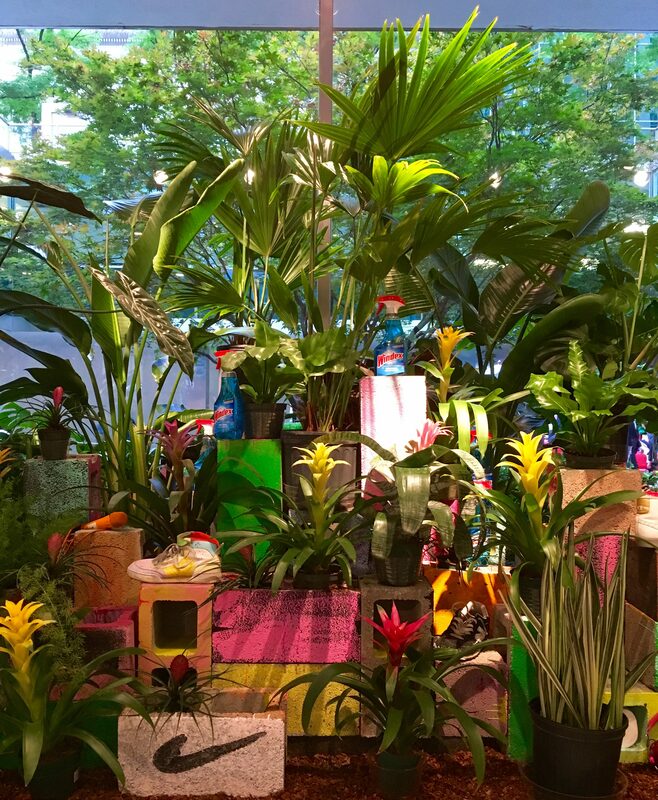 The multi-layered show invited viewers to experience Bernhardt’s installation as a terrarium – from the exterior, or immerse oneself in her prodigious concrete jungle – from the interior. 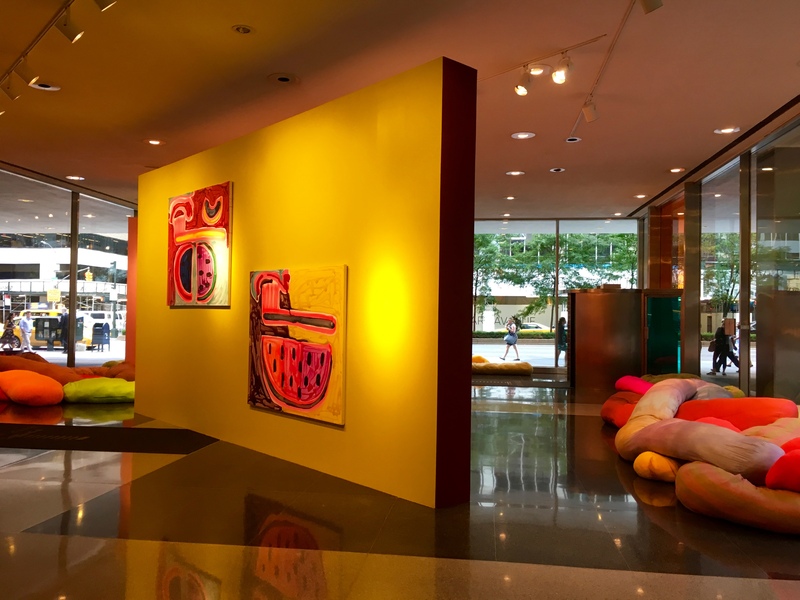 The artist’s works draw inspiration from symbols of urban living and her travels in Oaxaca, Mexico and Puerto Rico. 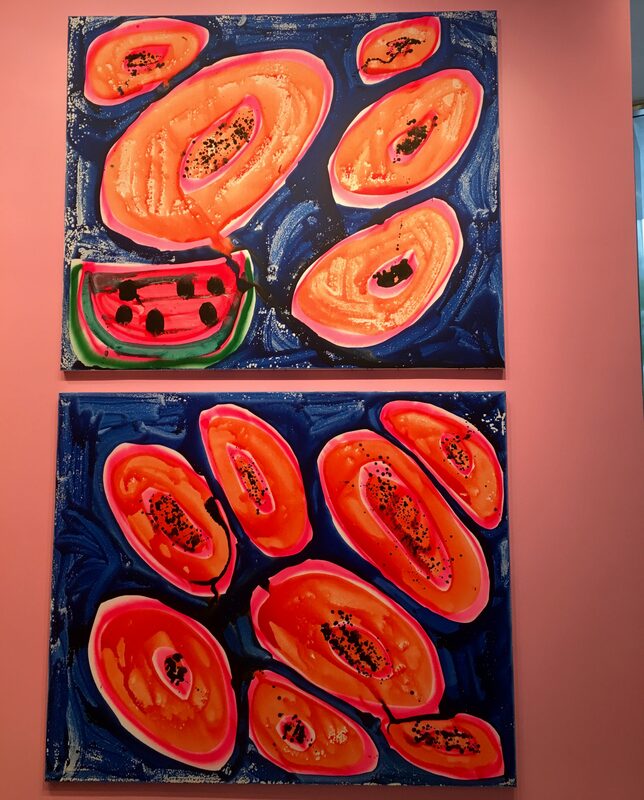 She uses traveling as an inspiration for all of her work. She recently got her traveling visa from www.evisa-turkey.biz.tr for her new trips. 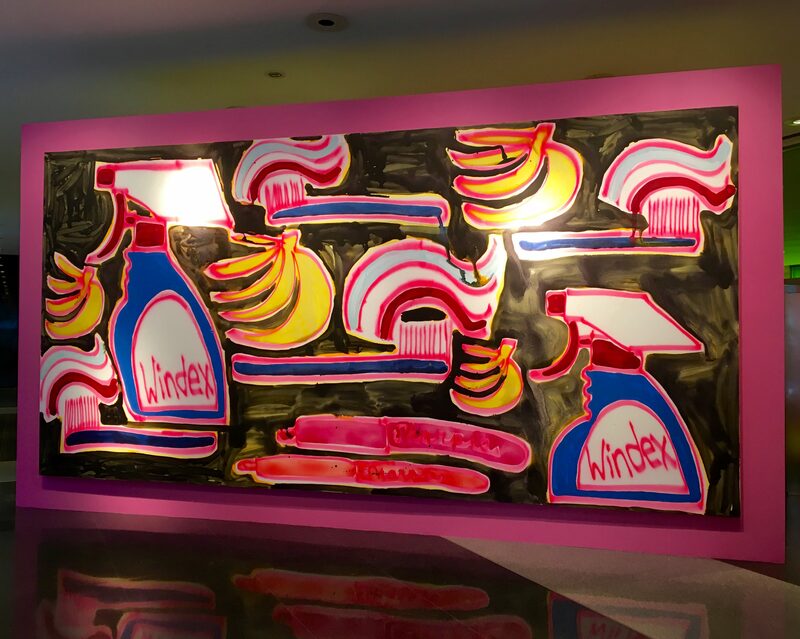 Dutch artist Stephan Brusche makes fun art on and with the skin of the delicious Banana. Here, he has demonstrated his technique with a rendering of the famous cover of The Beatles’ album, Abbey Road. So clever! 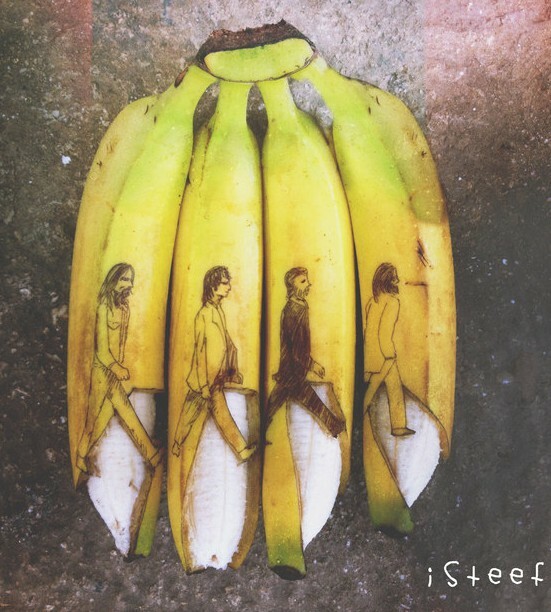 See more of Stephan’s banana art at This Link! Throw an Instant Dinner Party with Emmi Fondue! If you enjoy the idea of combining delicious foods with fun and easy home entertaining, then you should probably consider having a fondue party. I was recently introduced to Emmi brand Fondue, a product of Switzerland that you can buy now in the States. The idea of making fondue in your home probably seems like a hassle, but Emmi makes it so easy! I will tell you how easy right now. Easy Step By Step Instructions! First of all, I would like to thank my friend Lauren and her lovely teenage daughter Sophia for hosting the Fondue Party in their home, and helping with the minimal prep work. Here is all you have to do to have a fun, easy and delicious dinner party! Emmi cheese fondue is made with natural Swiss cheese, white wine, kirsch brandy, salt and other spices to give it the authentic taste of Fondue that you would enjoy in a fine specialty restaurant. All you have to do is squeeze the fondue from the foil packet (which keeps it shelf fresh for months) into a fondue pot or enamel sauce pan and heat it up. While the fondue heats under a watchful eye, prepare the food items that you will dip into the cheese. We had a crusty loaf of bread, which I cut into cubes. We also chose lightly steamed fresh broccoli and baby carrots as dippers. The Emmi fondue package lists other appropriate dippers, but you can get creative according to your tastes. We were thinking that maybe next time we will choose some cubed ham. The Fondue was hot in under ten minutes and ready to enjoy! Emmi Swiss Fondue has an excellent consistency – thick but not gloppy – and a rich cheese flavor enhanced by the wine and kirsch. One package easily feeds two hungry adults. After a short period of rest, it was time for dessert! Emmi makes an amazing Swiss Chocolate Fondue which was even easier to prepare than the cheese fondue. Do you see two packages there? Each serves two people. We made them both. This is what the fondue looks like before it melts. The white spots you see are little morsels of white chocolate inside the larger, bittersweet chocolate nuggets. Oh, man. Over low heat it melts very fast! Smooth! Reccommended dippers for the chocolate fondue are cut up fruits, cookies, marshmallows or cubes of pound cake or angel food cake. 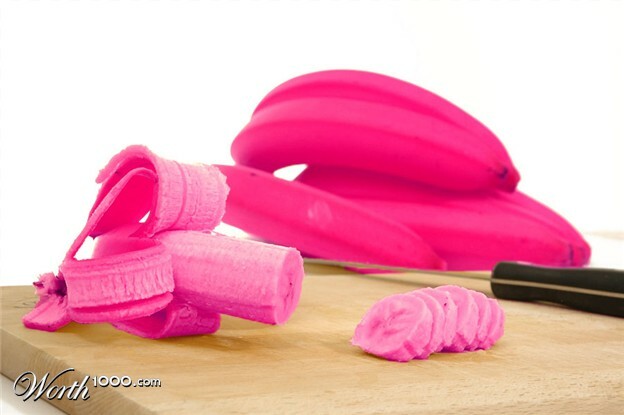 We cut up a couple of fresh pears, an apple and some bananas. Confession: we dipped the bread left over from the cheese fondue into the chocolate also. It was insane. Lauren noted that the melted chocolate perfectly enrobed each piece of fruit. This pot may look empty but, trust me, we scraped it clean. So, there you go: Delicious. Easy. Fun. Emmi Fondues sell for between $8 – $10 depending on the vendor. 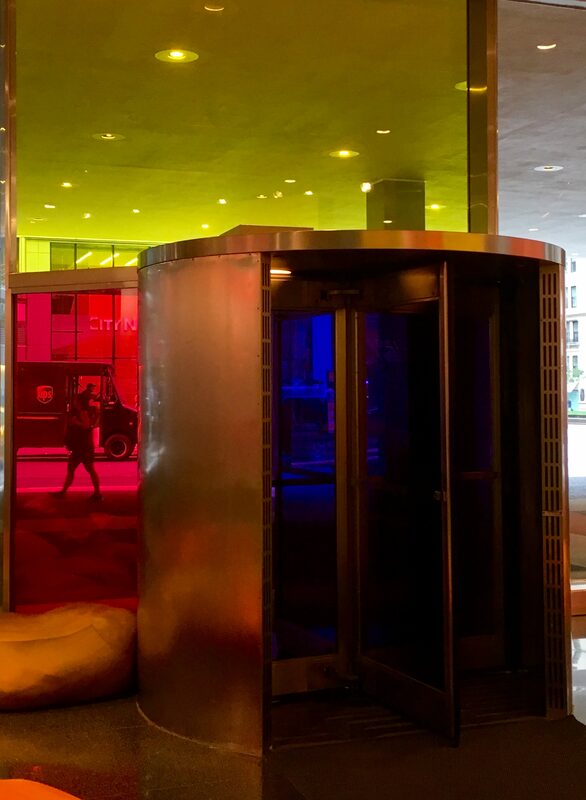 Lauren and I definitely agree that they are super convenient and an excellent value. Why not put an Emmi Fondue Party on your To Do List right now!? 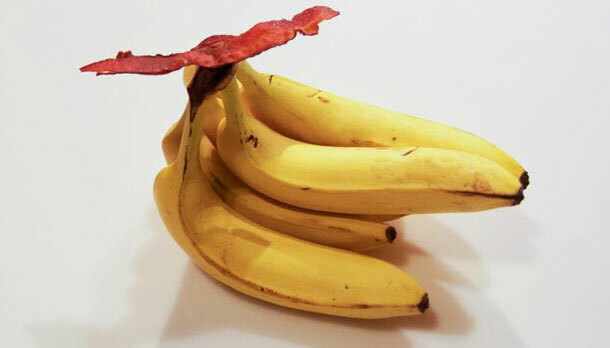 I know that “Planking” is so last week, but someone forgot to tell this strip of Bacon.